Many of you will have received our end of year letter in the mail this week. If not, here is what you missed! Thank you for donating generously to CAGJ during this giving season, to help us continue to build the global food sovereignty movement! Right now, many of us are asking questions about how to build strong and sustained resistance, how to show up on the side of justice and people-powered democracy, and how to fight the impending fascist policies in our country. Community Alliance for Global Justice recognizes the political strife and terror of this moment – and the power of coming together and resisting together. Through our commitment to anti-oppressive principles in our organizing, we will not let the animosity of the election outcomes derail our collective and historical work toward justice. You have helped sustain and grow CAGJ into our 15th year so that we can rise up to the moment and build a better world. Thank you. As we move forward, ready to strategize, organize, and mobilize, and linking with other struggles for justice, we hope you will consider giving at this time. We are proud to share our top achievements of 2016, thanks to your support! 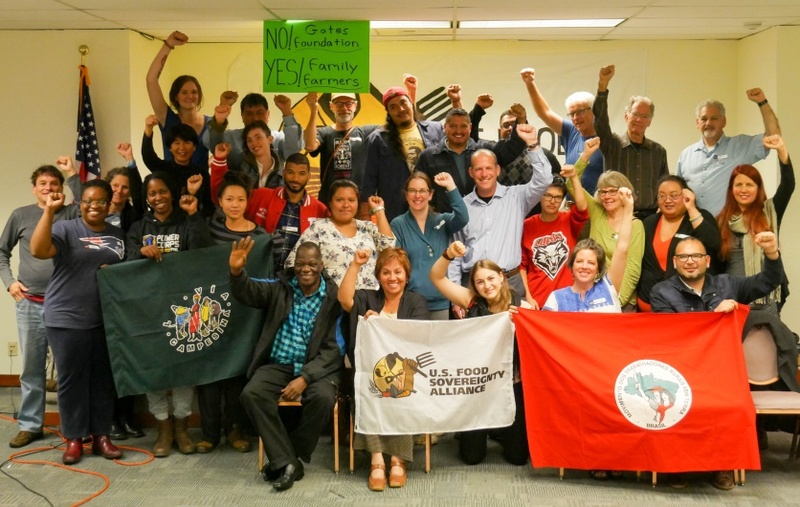 2016 US Food Sovereignty Prize and Encounter: CAGJ organized the 2016 Food Sovereignty Prize in October, co-hosting with Community to Community. Over 20 organizations from around the country gathered for several days of dialogue, action, and a ceremony to award the Alliance for Food Sovereignty in Africa (AFSA) and Farmworkers Association of Florida with the Food Sovereignty Prize. AGRA Watch co-presented our critique of the Gates Foundation with AFSA, and led an action at its headquarters. The enclosed report shares more details on this huge achievement! Going forward, we are planning a 2017 Pacific Northwest Food Sovereignty Encounter – contact us to get involved! GE Salmon Campaign: In 2016 we received a $5,000 grant from the Muckleshoot Tribe to raise awareness about Northwest tribal resistance to GE salmon. We are excited to announce that in 2017 we will release a short film made with Director Tracy Rector, Executive Director of Longhouse Media (and 2016 Stranger Genius Award winner)! Also, in March we will hold an educational and culinary event at UW Intellectual House featuring locally caught wild salmon. GM Banana Campaign and Action: We challenged the planned human trials of the techno-fix, genetically-modified “super banana” funded by the Gates Foundation, which threatens to flood the Ugandan market and destroy heritage verities central to Ugandan culture. In February, in coordination with African partners and Iowa State University students (where the trials would take place), we carried out a very successful joint delivery of a CREDO petition with over 57,000 signatures to the Gates Foundation, receiving major press coverage. The feeding trials continue to be delayed. Capacity-Building and Hiring: We were able to secure funding to hire a new organizing director, Simone Adler, who joined our team in October this year. Simone spends half of her time on AGRA Watch organizing specifically, at a key moment to expand this campaign! UN Conference on Biodiversity: In December, CAGJ staff and two AGRA Watch members will travel to Mexico as a delegation to participate in the United Nations Conference on Biodiversity and meetings on the treaties that shape international activity on GMOs, biodiversity, and biopiracy. We will host a side event with our European and African partners called “Biodiversity Under Threat: The Gates Foundation, Philanthrocapitalism, and the Capture of African Agricultural Biodiversity”. You know that when the grassroots is empowered we will go further in affecting change because you have helped us accomplish our work! With nearly all of our funding coming from individuals throughout our 15 years, this work is not possible without our supporters like you. p.s. In our 15th year, we are seeking 15 new Sustainers at $15/month! If you are not already a Sustainer Member, please consider becoming one at this time, at $15/month, or whatever amount you can afford! Sustainers agree to have funds automatically deducted from their account, allowing CAGJ peace of mind, and more time to focus on organizing. Posted in Events, News, Slider.